This is probably the biggest profit I have ever made from the TP in six years. For evidence, I include the other transaction histories, which I think the API records up to the last 90 days or so. Not exactly six years’ worth of proof, but it gives you the flavor of the scale of my normal TP transactions – in the 5-50g range. As for the nullification sigils, there was certainly no first mover advantage for cross-continental souls like me. Game patches drop at midnight on a weekday when we have to go to work the next morning. 8-12 hours are spent commuting and working and on other real life activities while most of the rest of the world has played all the new content to death, before I can sit down to even download the patch. I doubted they would ever skyrocket, but I figured that perhaps one day in the future, if boon strip ever became more prominent, they might rise a little in the meta’s eyes and be worth oh, a gold or 70ish silver. At 2.75s or so, it was a steal to buy a stack of 250 from the TP and stuff it in the personal guild bank. I recall considering if I wanted to buy more, but I told myself realistically that despite the hyberbole and envy of wild profits by random commenters, it would be hard to actually release and sell off multiple stacks without crashing prices by letting go of too much at once. A kind of tragedy of the commons, in a sense, if individual greed overtakes the collective consciousness of the resource owners holding on to the monopoly and keeping prices high. Still, I maybe should have bought -one- more stack. Heh. Isn’t hindsight fun? Come Sep 2018, the unthinkable jackpot happened – Anet creating a demand for it via recipe (like the hundreds of other resources I’d missed the boat with in previous years) and some mixture of Reddit gossip-reaction (possibly engendered by people who stand to profit and indignant random bystanders) sparking a Dutch tulip panic buying mania. I sold some at 1-2 gold at the start of the demand surge; I sold at 5-6g as the prices started rising; I was busy trying to sell and raid my first raid night because prices were at 8-10g and climbing; by next morning, they had dropped to 7-8g and I sold a few more. The weekend hit and prices soared to 10-12g and I sold still a couple more. Monday weekday and prices dropped to 8-9g and I sold a bit more. I mean, let’s face it. Whatever price I sell for, it’s a profit when you bought ‘em all for 2.75 silver or thereabouts. The rule in stock markets is not to get greedy. Even if I’m selling to speculators who buy at 7g to list at 12g to make a secondary profit, why not? They benefit (and absorb the risk if the market crashes), and I still turn a profit either way. Win-win. Eventually the price will crash down somewhat, though it’s unlikely to drop back to costing only silver in a hurry. It’s certainly more liquid gold than I have ever owned in one place. A TP baron, I am not. Those are out there trading in the tens of thousands of gold. 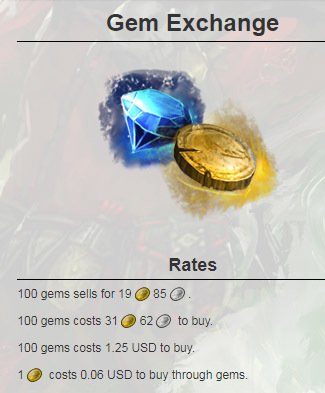 …let’s just put the numbers into perspective, against the gem and real money currency market that is always running in the background of GW2. 155 sigils, at say, 3 silver per. That’s about 4.6g to buy. 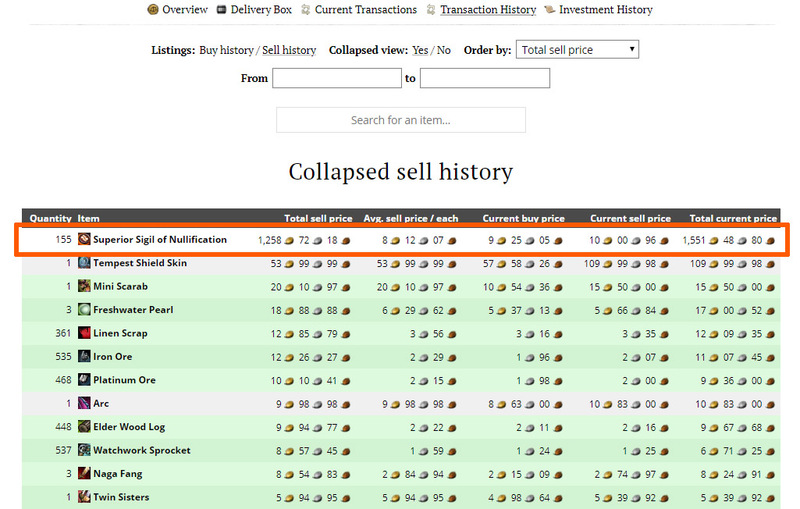 Let’s assume I made 1258 gold, by summing the sell transaction histories. Storing the stuff over 2 years, or 104 weeks, means it’s about 12g a week in return. You can get 14g a week just doing dailies daily. Granted, it was a nice lucky insta-bonus for only sacrificing one guild bank slot, but my point is that there are a good number of average people out there who -can- afford to buy the resource at that pace of earning. -That- takes time, of course, and patience, which is oft in short supply… From thence, does profit lie. If I took that 1258 gold (1069g, really) and converted it all to gems at the current exchange rate, it would net me 1258 / 31.62 * 100 gems = 3978 gems. An earlier calculation was $47.5 USD, depending on the fluctuating gem prices. And if you take my actual profit, after Anet sunk their 15%, that brings it down to $42.25 USD. In the $40-50 USD range, let’s say. It’s not insignificant, but let’s face it, the average consumer buys games worth more than that. An cosmetic armor set in PoE costs $42 USD, and I bought an overpriced Rhino/Nyx Prime pack in Warframe for $59.99 because I really really wanted Rhino Prime. To say that I made the equivalent of $50 USD by selling hoarded sigils sounds like a lot, but the truth is that there is the equivalent monetary worth of this exchanging hands at lightspeed across tons of games every moment. Let me quantify that further – $40-$50 in a week (six days, if you want to nitpick) and it was only possible because I held onto a resource for two years and got lucky, it’s not a repeatable on demand occurrence unless you’re spending every hour in game monitoring prices like a mini stock market. If you live in a country where the average weekly wage is lower or equivalent to this, you have my sympathy, but I suspect the majority of those with the free time to play an MMO do not. I mean, the cost of the internet connection itself would already be crippling in such a case. Now, let’s take the other exchange rate that is more relevant, the amount that someone else has to pay ArenaNet in order to pay me my modest little lottery payout. Let’s just make it a nice round $80 USD. For this hypothetical someone with a really powerful urge to have glowy armor now and loose wallet strings to convert it all into 1258 gold. For 155 sigils, for which you frankly only need 25 for the glowy requiem armor collection. So actually, we should split this hypothetical extremely rich someone into 6.2 (155 sigils / 25 sigils) individuals. Let’s say 6 individuals to make it a round number. To give me 1258 gold by legitimately exchanging gems to gold through the official won’t-get-you-banned avenue, they would need to exchange $80 / 6 people worth of gems. $13.33 USD, in other words. Slightly less than the standard price of a monthly MMO sub. Which we know quite a few people are able to afford. Hell, if we had three to four individuals that were willing to buy the equivalent in gems of a WoW flying mount from the Blizzard store priced at $25 USD, that would make up the 1258 gold right there too. In an MMO containing some two to four million accounts, possibly 200k in population count (based on 198k GW2efficiency accounts signed up and 188k Reddit subs – which should skew towards accounting only for the players dedicated enough to sign up to third party sites), is it truly that unthinkable that there are 3-6 individuals in that number willing to convert $15-25 USD to gold, to basically power their way through to a desirable set of glowy armor and get it now? Mind you, if we assume one junior to average game designer’s monthly salary is ~$2000-$3000 a month, you’ll need the equivalent of 133-200 $15 monthly subs just to cover that one individual. The scales of the actual numbers involved go a lot beyond $80 USD. That’s really all it takes to add up to 1258 gold. To an ordinary player, it seems like a lot. To me, it’s an unexpected windfall. In the realm of the big whales who play with real life money, it’s pocket change. P.S. As for what will happen to the 1258 gold, chances are more than likely that it will get sunk back into the game in some way. It might enable me to finish the cultural armor collection, or help me build Astralaria (something I’ve wanted for a while but was always loathe to attempt); I have briefly entertained the insanity of sinking it all into the “I’m Rich, You Know” title, as this is probably the only time I will see 1000g in one place; I could convert some to gems to buy shiny mount lockbox skins. Pundits will advise to reinvest it into the TP in the hope of more profit, but I’m not really a trader by nature, and all gambles are ventures with some amount of risk – if I cash out now, I can enjoy some of the gains, rather than hedging against an uncertain future, which might not come if the game closes or I quit or whatever. P.P.S. As for ordinary players unwilling to pay current prices by whatever means, for heaven’s sake, just wait it out. The first days and weeks are always more prestigious and more valued by those who want it now, and want to show it off, and they -will- open their wallets where you won’t. The current market rate has determined that some people are willing to afford and pay 150-250g (~$10-15 USD) to finish their collection, be it due to OCD or greed or plain impatience. Prices will drop as they finish, and people will bite at different price ranges. It’s the nature of the beast. I was completely unaware of this whole affair until ten minutes ago, when I refreshed Feedly and saw both the MassivelyOP news item and your post. I haven’t heard a single person mention it in map chat – in fact I have only heard the new armor mentioned once, when someone linked a full set. Almost no-one responded at all. No-one in my 480 person guild has mentioned it either. When I read the typically hyperbolic, scaremongering M:OP piece I assumed the Sigils had climbed to some outrageous price – I was imagining 100G each at the bare minimum. Ten gold is not expensive for a component in armor, ffs! At 10g a pop and 25 for the set that’s half the cost of the Griffon and as you point out the cost is dropping as we speak. Annoyingly, like you I bought a bunch of the Sigils of Nullification back when they were supposed to become the new hotness. Someone in my guild said they would be meta soon and they were cheap so I bought some – not a stack, just a few, but still. Of course, they turned out to be a dud and I sold them on in a spring cleaning purge a long time ago. Never mind – by the time I get around to making the armor the Sigils will be down to a couple of gold again and I have around 10k in gold across my accounts. It soon builds up if you never spend any! The benefit to ArenaNet of forcing currency to change hands is that it’ll eventually find its way to someone who will spend it in one of the many in-game resource sinks. When I’m actively playing GW2, I can barely maintain 200g in the bank. There’s always something I’ll want to spend it on.